FFA - Liberty Mutual Insurance Company is a leading sponsor of MSNBC's dishonest, anti-Christian, pro-Islamic news reporting. The timing of Liberty Mutual Insurance Company’s sponsorship coupled with blocking emails appears to indicate that Liberty Mutual Insurance Company is not only okay with MSNBC’s anti-Christian and dishonest program content but that Liberty Mutual is increasing their stake in the shameful reporting against those who disagree. Nissan ad drops from MSNBC web site after dealerships received thousands of emails. Liberty Mutual Insurance takes their place as a leading MSNBC advertiser. Click here to send your email to Liberty Mutual Insurance Company officials. See note below if you have difficulty sending email. Florida Family Association started a campaign on October 1, 2012 to challenge MSNBC’s dishonest, anti-Christian, pro-Islamic news reporting. Florida Family Association supporters’ emails complaining to advertisers about MSNBC’s shameful reporting are very important to the results of this campaign. Supporters’ 1,265,259 total emails to advertisers are already achieving results. Florida Family Association counted forty three (43) companies that discontinued advertising on four prominent MSNBC shows during the last monitoring period. Another email campaign was launched on October 24, 2012 which identified Nissan as the sponsor of MSNBC’s Andrea Mitchell show and sole MSNBC web site advertiser. Thousands of supporters of this campaign sent emails asking one hundred (100) Nissan dealerships to urge Nissan corporate to stop spending their advertising dollars on MSNBC’s shameful news reporting. Good News! Nissan is not advertising on the MSNBC web site. However, it is too soon to determine if Nissan will continue advertising on the MSNBC television network. More time is needed to monitor MSNBC before calling off this campaign. Blocked supporters' emails sent through Florida Family Association's email server. Sponsored MSNBC's Rachel Maddow show. Florida Family Association is committed to confronting MSNBC’s dishonest and anti-Christian reporting, which is unparalleled by any other news network. The overwhelming majority of the 3,600 advertisers that Florida Family Association has communicated with during the past twenty four years do not advertise during sitcoms that disparage Christianity even though the content of sitcoms is not intended to be taken seriously. So why would these companies advertise on a news network, which is intended to be taken seriously, that routinely denigrates Christianity, distorts the truth and advocates for Islamists? Florida Family Association has prepared an email for you to send to Liberty Mutual Insurance Company officials. Note regarding email prepared for you to send: Liberty Mutual Insurance Company is blocking the email server that Florida Family Association normally uses for supporters to send prepared emails. The email prepared by Florida Family Association for this campaign will open in your email browser and be delivered by your Internet Service Provider. If you have any problems sending this email please use the below contact information and suggested email to send the email through your email browser. Comcast was the only Internet Service Provider that was tested which failed to read this email. Therefore, Comcast users will need to prepare their email. To send your email, please click the following link. The email will open in your email browser. You may also modify the subject or message text if you wish. I will remember Liberty Mutual advertising support for shameful MSNBC reporting. I was disappointed to learn that Liberty Mutual Insurance Company became an MSNBC television sponsor and sole web site sponsor after being informed about their anti-Christian and dishonest reporting by thousands of concerned consumers. It was equally troubling that Liberty Mutual blocked emails from people voicing these concerns. Most reputable companies do not advertise during sitcoms that disparage Christianity even though the content of sitcoms is not intended to be taken seriously. So why would your company advertise on a news network which is taken seriously, that denigrates Christianity as well as disregards and distorts the truth and advocates for Islamists? 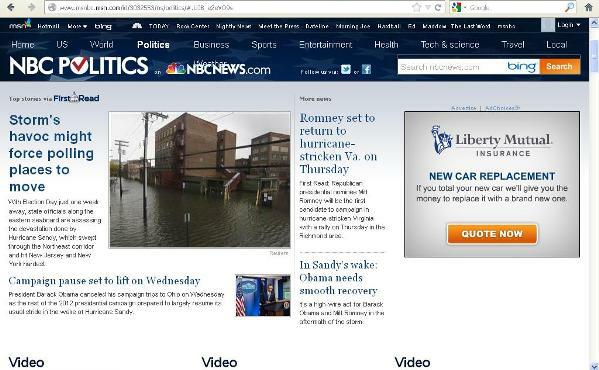 I will remember the ardent advertising support Liberty Mutual Insurance Company gave MSNBC when shopping for insurance.